A modern, cosmopolitan city, Barcelona is also the perfect destination for children (we should remember that the under-12s account for 12% of the total population in the Catalan capital). The list of cultural and leisure activities aimed at young people is extraordinary and practically endless. That is why, in 2007, UNICEF recognised Barcelona as a Child-Friendly City, thanks to its countless initiatives aimed at including children and treating them as what they are: citizens with the right to enjoy their city and to make their voices heard. In Barcelona, families never have time to get bored: there are museums especially designed for children, and cultural centres that organise workshops to stimulate their curiosity and knowledge, as well as plays and musicals, children’s bookshops and an impressive network of public libraries that encourage reading through workshops and storytelling sessions. Other attractions include open-air places where children can run and play, hundreds of clubs where federated athletes can play official sports, a hundred-year-old funfair and even many child-friendly restaurants with menus designed to delight palates of all ages. And then there are the many popular festivities and major festivals aimed exclusively at young audiences. For example, every year, the Children’s Festival turns the Fira de Barcelona trade fair site into a vast area devoted to younger visitors, whilst the Món Llibre Festival, which takes place at the Barcelona Centre for Contemporary Culture (CCCB), brings Sant Jordi (St George’s Day, World Book Day) to younger audiences with activities that focus on reading, all especially designed for children. Finally, children take over the city and even read the official opening speech at Les Festes de Santa Eulàlia winter celebrations. All this amply demonstrates that the construction of Barcelona also takes into account children and families, their opinions, needs, priorities and rights. In fact, every year, through the city’s schools, Barcelona City Council organises a public audience aimed at local children. Moreover, the city’s Natural Science Museum has established a Children’s Council formed by 16 young people which acts as an advisory body concerning how the museum is managed, as well as its content and activities. Perched on the peak of Mount Tibidabo and also known as the “Magic Mountain”, this is one of the oldest funfairs in the world. Here are attractions that go back over one hundred years, including the Automat Museum, the Airplane and the Talaia tower. The Oceanarium at l’Aquàrium de Barcelona is unique in Europe. The four-million-litre tank houses the sharks, which visitors can see close-up thanks to the transparent underwater tunnel, 80 metres in length. This outstanding attraction also features no fewer than 35 aquariums, recreating a habitat for around 11,000 animals. The zoo houses some 400 species, and facilities also include a farm with domestic animals. Barcelona Zoo is also where a veritable symbol of the city, Floquet de Neu (Snowflake), the only albino gorilla known, lived and died. These historic, iconic boats were first launched in 1888. The popular vessels take visitors along the Barcelona coastline, enabling them to enjoy some of the most unusual views of Barcelona: from the sea. The boats, which depart from moorings near the Monument to Columbus and from the Fórum Port. 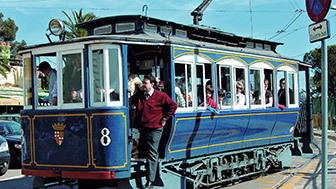 The cable car, which entered into service in 1929, links the port with the slopes of Montjuïc. The 1,292-metre journey takes 10 minutes. The 107-metre-high Jaume I tower also houses a scenic restaurant. The cable car is particularly popular with children, who love enjoying the views across the port as they ride just over the sea. This science museum is housed in a Modernista (Art Nouveau) building. Devoted to promoting understanding of science, CosmoCaixa features such attractions as a geological wall, a flooded forest, a room devoted to the evolution of matter. This unusual attraction takes visitors on a journey through the world of chocolate from its discovery by Europeans in the 15th century and its introduction in the Old Continent, not forgetting its nutritional and medicinal properties. The main exhibition at the Museu Blau (Blue Museum) natural history museum, entitled "Planeta Vida" (Living Planet), introduces visitors to the history of life on Earth. Housed in the Drassanes Reials royal shipyards, the Maritime Museum has a history spanning more than eighty years. The museum’s educational programme is especially designed to enable younger visitors to discover the maritime heritage conserved here. Housed in L’Auditori concert hall site, the Music Museum hosts a permanent exhibition featuring 500 musical instruments from different periods and cultures. The facilities here also include an interactive room where visitors can handle real instruments. The Camp Nou stadium contains a sanctuary devoted to the football club that is “more than a club”. At this museum, visitors are taken on a journey through the history of FC Barcelona that features all the trophies the club has won over the years, as well as areas devoted to the club’s most famous players. The “CaixaForum Kids” programme promotes art through workshops and shows aimed at families. Moreover, activities at this centre include exhibition routes for children with educational material. Besides organising workshops and literary prizes for young people, Barcelona’s public libraries also conserve an excellent catalogue of resources for children. The city’s 51 civic centres promote theatre, music, dance, film, the fine and visual arts and popular culture, as well as organising programmes of family activities aimed at fostering young people’s interest in local culture and knowledge. These centres provide a wide selection of age-appropriate, quality games for children. The facilities include areas devoted to psychomotor education, pretend play and multimedia, as well as points providing information about games, toys and child development. 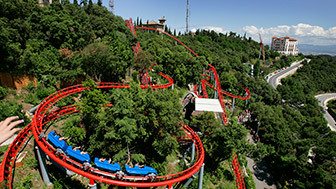 The former Montjuïc Amusement Park site is now occupied by a large park with an original children’s play area. In the “music space” are cushions that emit sounds when the youngsters stand on them. There is also a wooden organ and a see-saw/keyboard to enable children to experiment with sounds as they play. Children in the Eixample district have their own beach in the Torre de les Aigües Gardens, a landscaped interior courtyard. The swimming pool, just half a metre deep, guarantees safe bathing for the little ones, whilst the sandpit is ideal for building short-lived constructions, bucket and spade in hand. At the foot of Montjuïc Castle is an attraction sure to delight old and young alike: two slides, long and steep, in the midst of nature. The descent is so fast that the less daring may need to put the brakes on before they reach the end. La Casa dels Entremesos enables visitors to discover some of the principal gegants (giants), capgrossos (“big-heads”) and other members of the traditional bestiary that appear at festivities in Barcelona. These fantastic creatures dance at such traditional celebrations as La Mercè (September 24) and Santa Eulàlia (February 12). Barcelona showcases the city’s folklore on Saturdays throughout August. This is when, in the centre of the Ciutat Vella neighbourhood, celebrations take place that feature such deeply-rooted traditions as Sardana dancing, castellers (human towers), bastoners (stick dancing), bestiary and much more. Castells are amongst the most thrilling street spectacles to be seen anywhere. These human towers, which can be up to ten stories high, are veritable prodigies of balance and beauty and an outstanding example of teamwork. Els Castellers de Barcelona demonstrate their prowess at all the city’s main festivities. Half gymnastics, half art, the Falcons amaze spectators with the figures they are able to build using only their bodies. The origins of this activity lie in the nineteenth-century Czech Sokol gymnastic society, which combined physical exercise with promoting national cultural values.